Malaysia and China kicked off their first ever bilateral military exercise on Monday. The joint table top exercise, dubbed “Peace and Friendship 2014,” was launched by the Malaysian Armed Forces (MAF) and the Chinese People Liberation Army (PLA) at the Malaysian Armed Forces Joint Warfare Center. The exercise marks a step forward in the Sino-Malaysian defense relationship. Although both countries had signed a memorandum of understanding (MoU) on defense cooperation in 2005, initial efforts tended to be focused on exchanges and education. Ties have moved forward incrementally over the past few years, however. For instance, in September 2012, the two defense ministries held their first ever formal defense and security consultation. And in June 2014, Chinese company Aerospace Long March International signed an MoU with Malaysian firm Aneka Bekal to offer a self-propelled surface-to-air missile system. When Malaysian Prime Minister Najib Razak last met Chinese President Xi Jinping on November 10 on the sidelines of the Asia Pacific Economic Leaders (APEC) meeting in Beijing, Xi had said that both countries should boost cooperation in areas including enhancing collaboration between their two armies and working together on law enforcement and safety. This exercise will no doubt be a step in that direction. The exercise is also being publicized as yet another boost for Sino-Malaysian relations as both countries commemorate the 40th anniversary of their diplomatic ties in 2014, which has been designated “Malaysia-China Friendship Year.” Malaysia was the first ASEAN country to normalize relations with China in 1974, under Najib’s father. Today, Beijing is Malaysia’s top trading partner, export destination, import source, and tourist-generating market outside of ASEAN. Yet in truth, despite all the fanfare, relations between China and Malaysia had been anything but celebratory for the first months of 2014. Beijing’s initial criticism of Malaysia’s handling of the missing Malaysian flight MH 370, which was carrying 154 Chinese, came across as unhelpful. Security fears stemming from the airline tragedy as well as a spate of kidnappings in Sabah also caused the number of Chinese tourists to Malaysia to plummet in the first part of 2014, pouring cold water over the government’s Visit Malaysia Year 2014 tourism campaign. 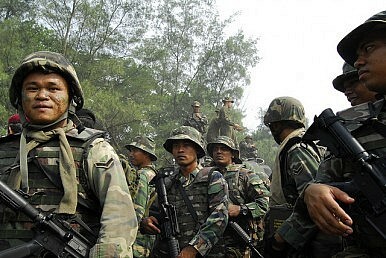 There has also been rising anxiety about Chinese encroachments into Malaysian waters, particularly as Malaysia is a claimant state in the ongoing South China Sea disputes. In addition, despite the progress that has been made, the security component of the bilateral relationship has also tended to significantly lag its other dimensions. Even Malaysian defense minister Hishammuddin Hussein himself noted the long nine years between when China and Malaysia first signed their MoU on defense and when he first announced plans to hold joint military exercises during an October 2013 visit to Beijing. “Peace and Friendship 2014” reportedly involves 22 personnel from the MAF and 21 from the PLA and is focused on areas including combined joint search and rescue, and humanitarian assistance and disaster relief. It is expected to run until December 26. Industrial parks and palm oil are two areas ripe for new agreements.